Baja stirs the soul. Those who are tuned into energy fields say that the coastal Sierra la Giganta mountains and the islands near Loreto form a basin for catching energy. No matter what you believe, the view from Carmen Island plays symphonies on the heartstrings as the evening sun works its way over the peaks, backlighting spires and painting both sea and sky with colors. 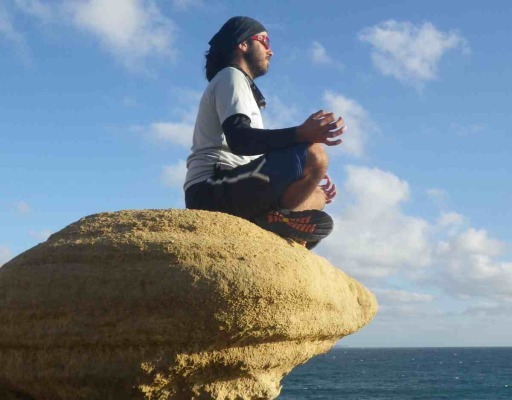 It is a place of new perspectives, not only personally, but scientifically as well. The Guaymas trench, in roughly the middle of the Sea, plunges nearly a mile deep, and belches volcanic and hydrothermal vents which support life based on hydrogen sulfide instead of sunlight. That discovery was a major shift in our understanding of what makes life possible. 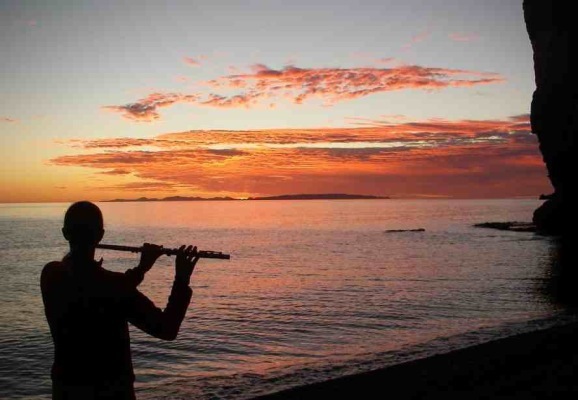 In the Sea of Cortez, the world’s youngest, most nutrient-rich ocean meets the diverse Sonoran Desert. Colorful volcanic mountains rise from the waters to protect pockets of pebbled beach. Ancient shells are fossilized in white sediments that form 30ft tall waterfront cliffs and erode into soft white sand beaches. Tenacious plants and well-adapted animals thrive in challenging conditions. Several cacti and some lizards, mice, and snakes are endemic to the area and live nowhere else in the world. The sea is a plankton soup which supports colorful reef fish like the orange-tailed king angel, schools of pelagic fish like the dorado, mysterious creatures like the paper nautilus, playful dolphins, and enthusiastic jumping creatures like the mobula–a small manta ray that leaps from the water, flaps vigorously, and splashes back down. Blue whales, the largest animals ever to inhabit the earth, also visit these waters, along with fin whales, humpbacks, occasional gray whales, orcas, and others. The National Marine Park of the Bay of Loreto manages five islands–Coronado, Danzante, Carmen, Monserrrate, and Santa Catalina as well as the adjoining coast along the base of the Sierra la Giganta Mountains. Crossings of 4 miles or less make some of these islands accessible to nominally experienced kayakers in calm weather. Longer crossing routes, exposed coastlines, and temperamental Baja winds also challenge the expert. 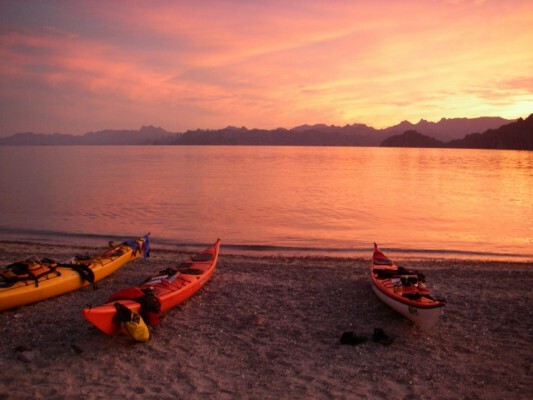 Paddling with Sea Kayak Baja Mexico, you experience this special place in a small group (4-8) of similarly experienced paddlers with the most experienced, enthusiastic, and highly certified guides and coaches in Loreto. You also paddle a Nigel Dennis or similar high-end single kayak with a carbon Werner paddle or Don Beale Greenland paddle. 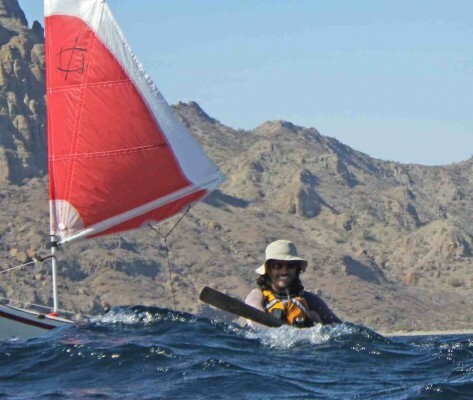 If you are a paddler, join Sea Kayak Baja Mexico and come for a real kayak expedition! “Why don’t you get a kayak, learn to paddle it, drive me to Mexico, and tag along for the season?” A whimsical invitation from kayak guide Hans Bruning in 1998 introduced SKBM founder Ginni Callahan to both sea kayaking and the Baja California Peninsula of Mexico. Although she’d led canoe trips for teens in the Adirondack Park for 3 summers and loved it, Ginni came to Baja the first year with no aspirations of a career in kayaking. It was purely for fun and the “Why not?” factor. Life turns on the finest of hinges. That spring, an opportunity opened up to guide at the newly opened Skamokawa Center in SW Washington. 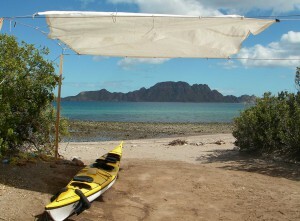 The following winter, Baja called again, and she went to paddle, surf, and explore. On one day’s notice, she accepted her first paid Baja trip, with Sea Kayak Adventures. 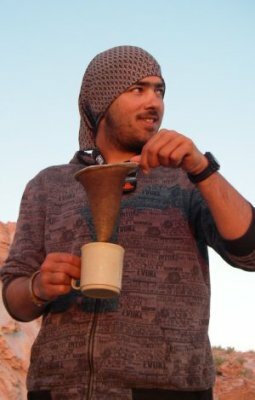 Ginni worked for SKA for the next 10 years, as assistant guide, then lead guide, then trainer of guides. Meanwhile, the newly formed National Marine Park of Loreto in which she was guiding was developing as well. The Park got an office in town and an employee. They named and renamed the beaches. They issued permits to camp. Eventually they got a boat and began enforcing the park permits. The old guides declared it the end of an era and reluctantly retired. Stormy years passed and calm years passed. Sand shifted on to some beaches and off of others. Chunks of rock broke and fell from Danzante Island’s undercut perimeter and left scars in the cliffs where they had been, and the scars began to weather. 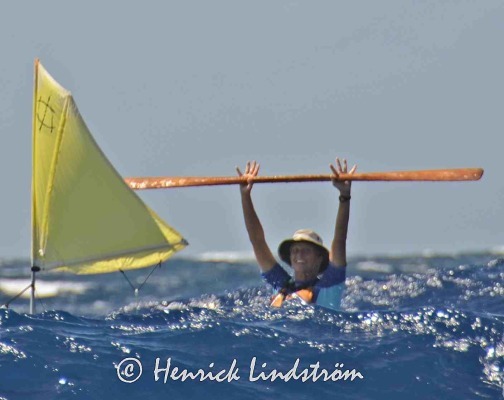 Meanwhile, Ginni became an American Canoe Association Advanced Open Water Instructor, then a BCU (British Canoe Union) Level 4 Sea Coach and a 5-star Sea Leader. Students in classes in Washington state asked for trips in Baja in performance single kayaks; trips that would challenge their skills. Something different from the “no experience necessary” trips like all the other companies offered in big tandem kayaks. In February, 2004 Ginni ran a pilot trip with friends and began looking into what it would take to offer such trips legally to the general public and to provide training courses for guides from other companies. 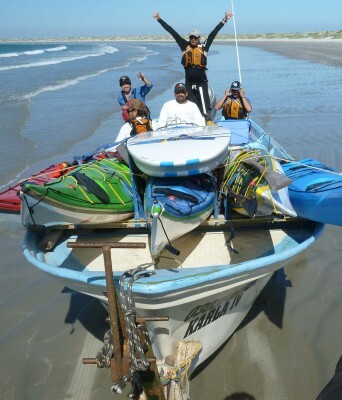 After sorting through misleading information several false starts, Sea Kayak Baja Mexico finally formed in May of 2007. The first trip ran in November, 2007. Sea Kayak Baja Mexico remains a small company by choice–unique, passionate about what we do, and good at it. Ginni oversees the operation, coaches, and guides. She originally ran all the trips, a role now shared by a team of spirited, talented, hard-working coaches and guides including Marcos Simental, Ramon Arce, Edgar Escobar, Maria Aguilar, Jano Garibay, Carolina Guzman, Alex Lecuona, and Yuri Hernandez. Ginni also originally did all the office work and gear cleaning and repairing, but now appreciates the enthusiastic support of a terrific land crew including Isabel Villalejo, Idalia Higuera, Carlos Gastelum and several of the guides. Join us and be one of the reasons we love what we do!